Looking for plants that will not just survive but thrive in the shade? You’ve come to the right place! 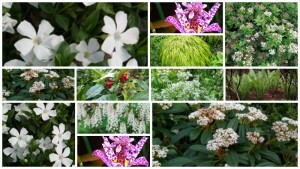 My plants for growing in shade guide is here to help and assist you avoid making those costly plant purchase mistakes. I have put together my list of plants that will grow very happily in the shade. (only, do not use them in a hot sunny border, they will not thank you for it). These are not just any plants plucked from an encyclopaedia, these are perennials, shrubs and climbing plants that I know will work in almost any shaded garden border. Just for an extra bonus I will also throw in some of my planting tips. Selected plants will thrive in a semi to fully shaded position in the garden. Whether it be shade created by fences, sheds, house walls and large trees. 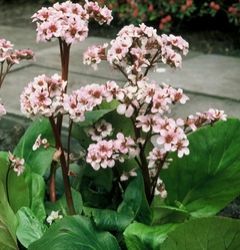 Bergenia are not called elephants ears for fun. This evergreen perennial is high on the want list when looking to create contrasting leaf textures and size. The foliage growing to 30-45cm high, Bergenias are the perfect plant for front of border ground cover planting in a shaded place. They will perform better with just a bit of sunlight a day. Flowers are predominately pink and the plant needs barely any maintenance per year apart from removing faded flower stems and dead leaves to keep the plant looking fresh and tidy. Ferns should be very near or at the top of the list for plants that thrive in the shaded garden and Polystichum polyblepharum is my favourite. Like most Polystichum ferns this one will absolutely thrive in a fully shaded border and polyblepharum offers more attractive foliage than the standard polystichum setiferum. 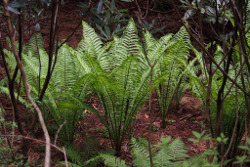 The foliage is evergreen and will grow in the typical shuttlecock shape we come to love from ferns. The leaves have a slight reddish vein adding extra interest to this delightful fern. Tip… Cut of all the previous years fronds back to the base of the plant in early spring when the new fronds are about to emerge. It is a great thing of joy to watch the unfurl almost daily. If you are vigilent with your slug control then plant with Hostas for a beautiful display of contrasting foliage. 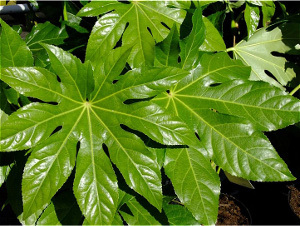 Fatsia japonica has huge evergreen, tropical looking glossy leaves and brilliant, slightly unusual looking white flowers in Autumn followed by black berries. It does like a bit a natural light, a couple of hours a day but not full mid day sun and you will see this evergreen shrub thrive. Otherwise known by its common name, Sweet box or Christmas box the sarcoccoca family are, in our opinion, the most highly scented, evergreen shrub one can plant in the garden for winter fragrance. 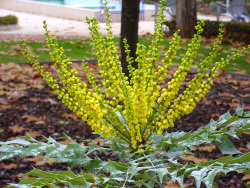 Planted by the kitchen or front door it is a very welcoming plant for those gloomy winter days. Small, glossy, evergreen leaves. White fragrant flowers in winter followed by black berries, Sarcocca vay digyna is also a great substitute for Buxus hedging. 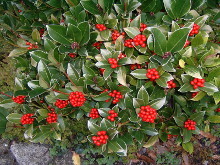 Now that box blight is sweeping up and down the country this evergreen shrub could be a contender for its replacement. Planted en-mass Spring Symphony is an eye catching small perennial for the front of the border. This little beauty has the lot. Gorgeous lobed mid green leaves which are veined with purple and in Spring a profusion of white spired flowers. 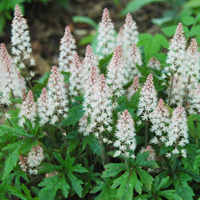 Tiarella Spring Symphony is a low maintenance perennial requiring just faded flowers to be removed to prolong flowering. If the foliage starts to look tired and messy just trim the whole plant back to ground level and it will spring back into life in no time with lush, fresh foliage. 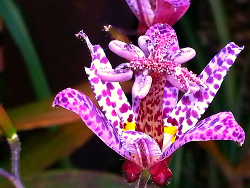 Reaching an eventual height this toad lilly is a super addition to the shady perennial border. With dark purple spots on a cream petal the flower is equisite and adds colour to the border in August and September when many other flowering perennials for the shaded border have done their thing for the year. Love them or hate them, Camellias are admired for their beautiful, delicate, rose like flowers from February onwards and Desire has a stunning flower. The petals start as a white then graually turning to a lovely pink closer to the edge. Unlike many other dark leafed camellias this one has a bright evergreen leaf, a real bonus for lifting shady borders. Tip… Eventual height and spread is 3m x 3m but can be kept to size providing it is pruned straight after flowering. Space on the patio, balcony for an extra pot? 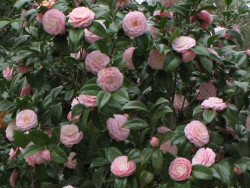 Providing the planter is filled with ericaceous compost at time of planting Camellias will do very well in planters. 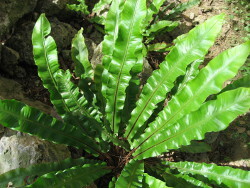 Otherwise known as the hearts tongue fern. Asplenlium scolopendrium is a stunning, architectural fern for the front of the shaded border. 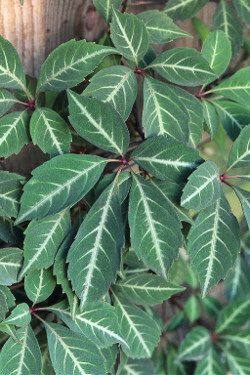 Large evergreen leathery leaves up to 30cm in length grow to form a beautiful rosette of foliage. Tip….. 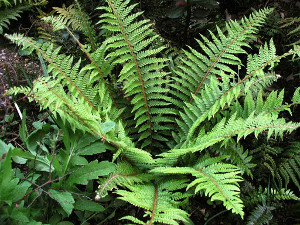 Trim back all of the previous years foliage when the new frond start to appear for a fresh looking fern for the year ahead. 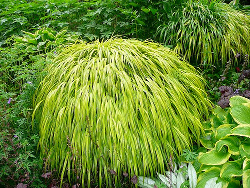 A gorgeous ornamental grass that will go along way to softening up garden path and patio edges and liven the senses. It’s billowing mass of leaves provide needed movement to the garden and look great when planted with contrasting leaf textures such as Hostas and Heucheras. A truly exceptional fern when grown in the right environment. Matteuccia struthiopteris is successful when grown in partial to full shade, clay, loam or a sandy soil with one condition. They need damp soil! Perfect for boggy ground or planted on a pond edge. What makes these a truly beautiful fern is they colonise naturally. Sending up new ferns close by from underground rhysomes not only is this ostrich fern stunning, you also get ferns for free! Our plants that like shade top 20 would not be complete without this exceptional perennial that loves partial to deep shade. Luzula nivea is classified as an evergreen perennial however it looks more like a low growing ornamental grass with narrow green leaves to 30 cm length. 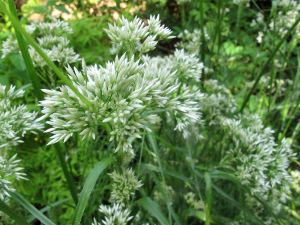 From late May onwards stems with clusters of white flowers appear which last for several weeks. Gently nodding in the breeze these are perfect for brightening up a shaded border planting scheme. 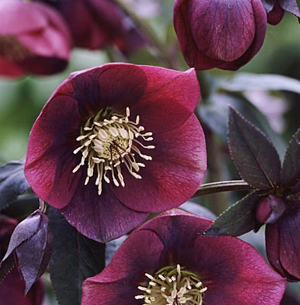 Tip… Plant in large swathes for a naturalistic, stunning effect. For those looking for a climber for a north facing wall then Chinese Virgina Creeper could be your answer. Stunning red autumn foliage and equally stunning silver veined leaves. Henryana is much less vigorous than the much used virginia creeper and can be grown on any aspect wall, north, south, east or west. Tip…. give some early support to this climber until it gets established. Grown for its long evergreen , leathery, dark green elliptical leaves Viburnum davidii is a top contender for a low maintenance shaded border. 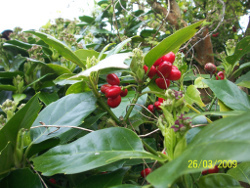 Height and spread approx 1m it is a spreading shrub. Small white flowers in Spring followed in Autumn / Winter by metallic blue berries. Tip… Mix with plants that with contrast with foliage shape or colour. A exciting member of the Laurel family and a perfect shrub for creating a low laurel hedge in the shade. Unlike other laurels, Rozannie grows foliage from the base and will create a dense, low maintenance hedge from the ground up. Purple flowering in Spring followed by red berries. Foliage is interesting, looks more like a mid green holly leaf than a traditional Laurel. A really valuable plant for ground cover & front of border planting schemes for a shaded border. 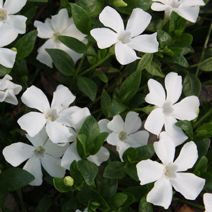 Vinca minors are great, low to the ground, neat but spreading evergreen perennials that will flower for months. The gertrude jekyll is no exception, with a flowering period from Spring to Autumn and weed suppressing foliage this a perfect addition to those wanting low maintenance gardening. The pure white flowers will lift any dark corner in the garden. 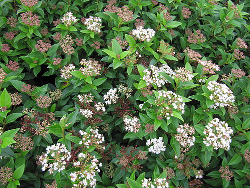 ‘Eve Price’ is a great, back of border evergreen shrub for partial shade. 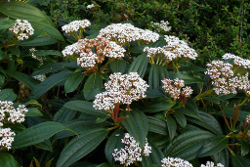 Dark leathery green leaves with starry white flowers opening from late winter. 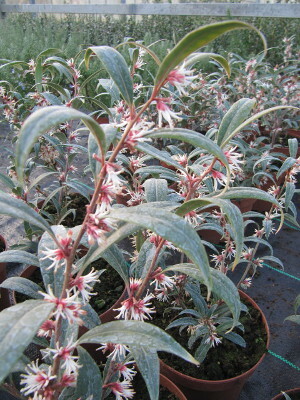 This shrub needs little maintenance and serves as a perfect foil for lighter coloured foliage plants. Kirengeshoma is an extremely useful perennial plant for the shade. Forming a clump up to 1.2m across, it is extremely useful at covering large areas of open ground in a short space of time. Especially useful if there are budgetary concerns. There are many things to admire with this plant. Gorgeous, medium sized oak shaped green leaves, purple stems and sublime nodding yellow flowers that appear in late summer and well into autumn. Grows well in all soil conditions but prefers an acidic soil. That’s it for now on my favourite plants for growing in shade. Check back soon for our guide on ‘climbers that like the shade’. The RHS has a really useful plant selector for finding and researching those plants that will positively thrive in the shade.